Since my birthday falls in October, I sometimes had a Halloween themed party when I was a kid. 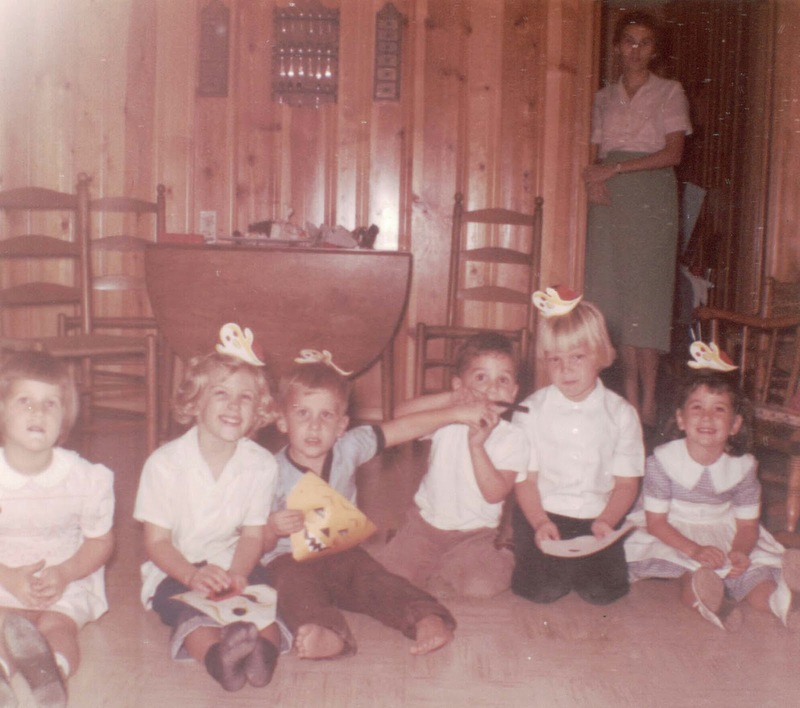 My 5th birthday. 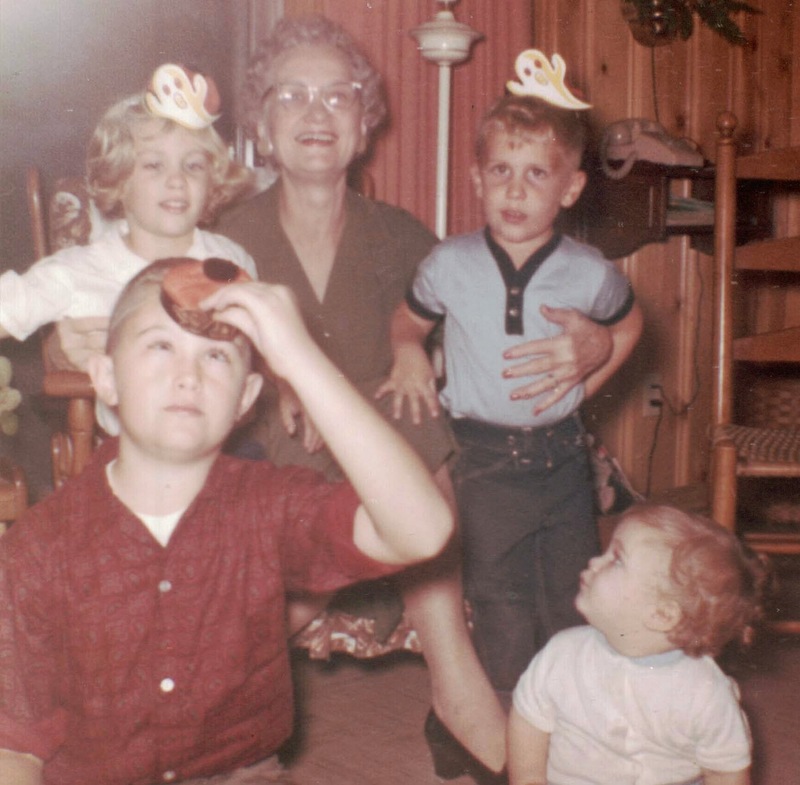 That's me on the left, my grandmother Helen Brown Thomas Pendleton, my brother Andy on the right, our brother John sitting on the floor on the right looking up at his silly big sister, and our first cousin Charles Joyner on the left sitting in front of me. The party I remember the most was the one for my sixth birthday. I had a bunch of friends from my first grade class and probably some neighborhood kids over for my party. It seems like there were kids everywhere. My mom hung apples on strings from the clothes line in our backyard and we had to try to bite them. That was fun! I think one of my friends lost a tooth in one of the apples. Another memorable thing about my sixth birthday is it's when I got my first bicycle. It was a little too big for me at the time, but I grew into it eventually. When I got it, I already knew how to ride a bike. I'd been practicing with my friend's smaller bike. With her bike, I was able to learn how to balance, because I was able to easily put my feet on the ground if I felt like I was going to fall. The first thing I did on my new bike was ride it down the driveway and fall into my dad's flower bed since I couldn't touch the ground when I took my feet off the pedals! It makes me laugh now thinking about it and the feeling of losing control that I had because I couldn't make the bike stop. I guess I'd forgotten that I could use the brakes. I was embarrassed when it happened because my dad was watching, and he was taking a photo! I looked for that photo, but it must be packed up with the rest of my old photos in my son's storage shed. One of these days I'll get them out (I've been saying that for several years now).